Would this be suitable stall flooring for miniature horses? They only weigh 200 lbs, but I'm concerned about their urine. Would the urine sit on top or soak between the tiles or into their pores? Our 8mm Strong Rubber Tiles would work as stall flooring for miniature horses. The tiles do interlock tightly, so liquids would have a tough time getting in between them. The tiles can be sealed with our Rubber Floor Finish and Sealer, which will prevent liquids from getting in the pores of the floor. We do offer non-porous tiles that don't need to be sealed. These interlocking tiles are just as easy to install as our 8mm Strong Rubber Tiles and will keep liquids from going in between the tiles. Examples of these types of tiles are our Rubber Gym Tiles, 3/4" Diamond Top Horse Mats, 1/2" Button Top Stall Mats and our 3/4" Waffle Backed Animal Mats. Can these tiles be used under water to protect swimming pool steps and bottoms? Our 8mm Strong Rubber Tiles can be used underwater to protect swimming pool steps and bottoms. We are looking to make part of a large room a home "gym studio." We were not planning to remove the carpet in the part of the room where we want equipment... we are just planning to place the flooring on top. Will this damage or stain the underlying carpet? If your carpet is a light colored carpet, there is potential for our 8mm Strong Rubber Tiles to stain the carpet. To prevent this, we suggest using a plastic sheet between the tiles and the carpet. Will this flooring move, does it need to be glued down or nailed down? In most installations, our 8mm Strong Rubber tiles will stay in place without any need for glue or tape. In certain instances, gluing the floor maybe necessary. Typically this is olympic lifting areas of commercial gyms. This is due to the amount of traffic typically found in these areas in commercial gyms. How easy is it to clean up dust, or more specifically, wood sawdust? would it be easily sweepable or would it require a strong blower, or water rinse? You can clean wood sawdust easily from our 8mm Strong Rubber Tiles with a blower and a hose to get any stuck on particles. Just like the tiles air dry and they will look like new! Can this be used for a garage flooring? if so, how does it hold up over time. Pics? Our 8mm Strong Rubber Tiles can be used as garage flooring. A car can drive over these tiles and now ruin them. There are a few things that you would have to be aware of having rubber tiles as a garage floor. The first is when oil comes into contact with this floor, over time the oil will start to break down the tile in the areas that come in contact with the oil. Most vehicles don't leak oil, but if you do have a vehicle that does, you can put a plastic sheet down where you park your car. The next issue that may occur is that when entering your garage if you make any hard turns you may pop the rubber tiles up. If you do run into this issue, you can easily glue the tiles down with a polyurethane adhesive. Would these be suitable for a restaurant kitchen floor exposed to fryer oil? Our 8mm Strong Rubber Tiles would work fine as flooring in your kitchen. If the grease is not cleaned up quickly, there is potential for it to get in the pores of the floor. We do have kitchen tiles and mats that a made specifically for this type of application and can be found on our commercial kitchen mats page. We have a condo in Florida on the beach that is about 150 sq ft. The building is old and has moved a bit over time due to the fact that its built on sand and has withstood a major hurricane. Consequently, most conventional coverings like tile are out as one area has a significant hump and there is also some unevenness due to overlapping "membranes" on it. Moreover, this area gets wet from salt spray regularly. So...will this product ride over our "humps" and will it get slimy?/mildewy either on top or underneath from the elements? Our 8mm Strong Rubber Tiles are very durable, but will not lay perfect if there are major issues with the floor. For floors with humps, we recommend using a rubber roll. Our 8mm Strong Rubber Rolls are made from the material but in a roll format. They are resistant to mold and mildew growth and will not get slimy from the elements. One issue you may run into is that salt may get in the pores of the floor. How do I get rid of the strong rubber smell? To get rid of the rubber smell of our 8mm Strong Rubber Tiles, we suggest using a mild soap and water solution. You may have to repeat this process a few times to get the smell to dissipate. Make sure you have enough ventilation in the room installed. Also, cleaning the tiles outdoors and letting them air dry also helps to dissipate the smell as well. Is this flooring able to be used in a restaurant kitchen? Our 8mm Strong Rubber Tiles can be used in a commercial kitchen. These tiles are very slip resistant when wet and are very easy to clean and maintain. If dirt and debris were to get under the tiles, simply lift them up clean them and let them air dry. Once dry you will be able to place them back to their original spot and your floor will look virtually new. Can this rubber tile be direct on top of hard wood floor? Is it safe to use a 300 lbs power rack? If not, do I need extra layer in between? You can install our 8mm Strong Rubber Tiles directly over hardwood flooring. These tiles are the same as the rolls that we used in the Biggest Loser Gym, so a 300 lb. power rack will be just fine on this floor. If you did have any concern about the rubber flooring staining your hardwood flooring, you could place a plastic sheet between the rubber and wood, but this is not necessary for most installations. You mentioned that with temperature fluctuations these tiles might contract or buckle if used outside. We would like to use them under a large patio covered with a roof. The temperature will fluctuate between 30-35 F at night sometimes in the winter and 95 degrees during the day in the summer. Would these tiles be suitable for this application? Our 8mm Strong Rubber Tiles can be installed under a large patio where there will be temperature fluctuations. To help alleviate these issues we recommend installing the tiles with an expansion gap of about 1/2" to allow for the flooring to properly expand and contract. Would this surface allow a basketball to bounce on it? We want to install in an area that has a hoop but are not sure if the rubber would prevent bouncing a ball. Our 8mm Strong Rubber Tiles will allow a ball to bounce on them. If you are using these tiles as a basketball court, we do recommend adhering these tiles as they can separate while performing certain basketball moves. You can first start out with no adhesive and then if need be, go to double-sided tape and if the tiles are still moving our 5900 adhesive. How do you clean these tiles? Do they provide any air circulation so no mold builds up underneath them? To clean our 8mm, Strong Rubber Tiles all you will need to do is sweep or vacuum any large dirt and debris and mop the tiles with a mild soap and water solution and let them air dry. Rubber is naturally resistant to mold and mildew growth, so unless there is some organic material under the tiles, no mold or mildew will grow. I am planning on using these tiles on a concrete floor in our basement that has radiant heat tubing in the concrete so the floor is warm. Will the rubber insulate the room from the warm floor and make the room cold? Any other concerns? Our 8mm Strong Rubber Tiles would not change the warmth of the room. These rubber tiles would act as an insulator and would help to keep the room warm. I see that the tiles are 23" x 23". Does this measurement include the interlocking edge, so that once I put two tiles together there is an overlap of 1" and thus the width of the two is now 23" + 22" = 45" i.e. every additional tile adds only 22" to the width? Our 8mm Strong Rubber Tiles, when interlocked, are 23" x 23" so when two tiles are interlocked the size would be 46" long by 23" wide. Are the edge pieces beveled? The edging on our 8mm Strong Rubber Tiles is not beveled. Can you install these tiles over a commercial grade carpet? You can install our 8mm Strong Rubber Tiles over commercial carpet. Are there any toxic fumes associated with these rubber tiles? Our 8mm Strong Rubber Tiles are non-toxic and do not off-gas any toxic fumes. These tiles go through a vigorous cleaning process to ensure the safety of the floor. These tiles are also tested to ensure no hazardous material is contained in them, and to get a copy of this testing; please feel free to contact one of our Flooring Heroes via chat, email, or phone. Are these tiles durable enough to use in an area where I would be siting on a chair with wheels and rolling around on it? We would recommend purchasing a chair mat for added protection just to be safe. I am considering these for my new cycle studio that has concrete floors. How do you clean dirt off them? ANd how about sweat? To clean our 8mm, Strong Rubber Tiles all you will need to do is sweep or vacuum any large dirt and debris and mop the tiles with a mild soap and water solution and let them air dry. I would use this in front of a dartboard - real steel-tip darts. Would a dart, dropped from, say 6' penetrate the rubber and make contact with my floor surface underneath? You can use our 8mm Strong Rubber Tiles for this application. The dart would penetrate the tile, but would not penetrate all the way through to the floor underneath. The rubber tiles would act like the typical cork boards that are used around dart boards, but it would be better since it is more durable and would last longer. Do you have corner or border tiles with options for a perpendicular beveled edge? Some of our tiles will be facing out into the room. Our 8mm Strong Rubber Tiles do not have beveled edging as an option. 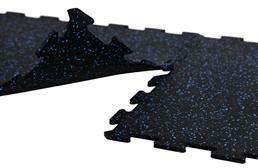 These tiles have a straight edge but to get a beveled edge, we recommend purchasing our Rubber Floor Ramps. Would heat over 100 degrees damage the tiles? I live in Arizona, and that heat is common in the summer. 100-degree heat would not damage our 8mm Strong Rubber Tiles. These tiles are made from the same material as your car tires and can withstand extreme hot and cold without losing integrity. We are revamping a large box truck into a tactical command post. Could get muddy and wet depending on weather. Is this a good item to put down for flooring and if so what is preferred cleaning method? How hard the tiles to cut to custom fit inside the box truck? The command post will be outfitted with chairs, conference table, computers and TV's. Our 8mm Strong Rubber Tiles would be great as flooring in a converted large box truck. These rubber tiles are very easy to clean. For large dirt and debris, all you have to do is sweep it out of the truck. For stuck on dirt and mud, we recommend using a mild soap and water solution and a synthetic or sponge mop to clean the floor. You would then let your flooring air dry. These rubber floor tiles are very easy to cut with a sharp utility knife and straight edge. They cut as easy as cutting butter and can be made to fit any space. Furniture can be placed over these tiles without damaging them or creating indents in the floor. Do you start the tile installation from the center of the room and work your way towards the walls? If you are installing only center tiles, we recommend installing our 8mm Strong Rubber Tiles from the center of the room. If you are installing your floor with center and border tiles, we recommend starting in one corner of the room and installing in a perpendicular pattern from the starting point. Any slipping/separating doing p90x on these tiles? Our 8mm Strong Rubber Tiles will not slip or separate when doing p90x or similar types of exercises. These tiles interlock very tightly and will stay interlocked. Would this work as a dance floor to practice ballet on or other types of dance? Would it have the right amount of give/support? Since our 8mm Strong Rubber Tiles would have superior traction, they may not be the best flooring option as the main floor for Ballet or other styles of dance. These tiles would be great as a subfloor for our standard line of dance flooring, which can be installed over these tiles. If you are looking for rubber tiles or rolls that would give you the proper controlled-slip that is needed, then some product examples that we offer are PaviGym's line of rubber tiles, our Impact Roll - Wood Series rolls, and our Impact - HD Series rolls. Is this flooring durable enough to withstand the rigors and traffic of a large high school football team and their cleats? Our 8mm Strong Rubber Tiles can be used as flooring in a locker room or dugout. These tiles are very durable and are commercially rated. We typically recommend using our 1/2" thick rubber or thicker for these types of applications, but these tiles would work. How do I create a "T" configuration with the 8mm strong rubber tiles? When I attach a center tile to an Edge tile to start to create the top of the "T," I get a small gap at the corner of the tile. When installing our 8mm Strong Rubber Tiles in an odd-shaped room, we recommend using all center tiles. The reason we suggest this is that not all tiles will interlock properly with each other. Center tiles can interlock with border tiles, but they will not interlock with corner tiles properly. Due to this fact, we recommend just cutting our center tiles to fit the space so that you can get a floor that looks uniform and professional. Do these provide a slight cushion as compared to concrete flooring for workouts (p90x/insanity)? Our 8mm Strong Rubber Tile will provide ample cushion compared to concrete when doing workouts like p90x or Insanity. Our 8mm Strong Rubber Rolls are the same flooring surface that you would find at any major gym. Do these tiles off-gas and have an odor? I want to use them in an enclosed trailer but can’t tolerate the smell of off-gassing rubber. Our 8mm Strong Rubber Tiles do have an odor to them, but it is not as strong as most rubber floors. To help dissipate this smell, we recommend mopping the floor with a mild soap and water solution with a synthetic mop head. We would also recommend letting the flooring air dry in a well-ventilated room. You may have to do this a few times to get the smell to dissipate truly. Our 8mm Strong Rubber Tiles are not rate as anti-static. These tiles will provide less of a charge potential compared to carpet, but can still create an electric shock. Our 8mm Strong Rubber Tiles are 23" x 23" in size. What is your suggestion for a rubber flooring for outside use? Children will be playing on this floor. Our 8mm Strong Rubber Tiles can be used as flooring outdoors, but we would not recommend them as flooring for a playground. For playgrounds, we would recommend using one of our playground tiles. We offer a wide range of tiles, mulch, and mats that would be great for use in any type of playground. You can find these products on our playground flooring page. What is the maximum pounds per square foot allowed on the rubber tiles to hold up? At a static load rate of 1000 pounds per square inch, these tile depressed less than .020 inches. So they will be able to withstand a good deal of weight before they indent. Would the 8mm Strong Rubber Tiles be suitable for exercises such as lunges, squats, burpees and jump rope? I need an anti-slip surface and some shock absorption. Our 8mm Strong Rubber Tiles can be used for all types of exercises and have been used as flooring in both commercial and residential gyms. These tiles will provide a very slip resistant surface to work out on even when wet and are shock absorbent. With certain exercises, there is potential for the tiles to pop out of place. If you run into this, you can use some double-sided tape in the areas that have this issue. I have a round room that I would like to cover the floor with 8mm Strong Rubber tiles. Can you cut a group of tiles so that I can install them into my round room. The room is twelve feet in diameter. What would be the cost for tiles and the cutting for a round room? You can easily cut our 8mm Strong Rubber Tiles with a sharp utility knife and a tool to keep your cuts straight. These tiles cut as easy as a warm butter knife cuts butter.